To put it in a sound way, "For any person, if a certain noise level doesn't seem to bother him as much as it did before, it's not because his ears have toughened up to it; it's because he has lost some of his hearing. In such a case, it's all the more critical to protect the hearing that is left." Excessive noise may cause a temporary or permanent hearing loss known as a temporary or permanent threshold shift. Noise-induced hearing loss (NIHL) is due to loss of hair cells in the cochlear portion of the inner ear. These hair cells vibrate when sounds pass into the cochlea and thereby, send electrical signals to the brain, which are perceived as sound. A temporary threshold shift may blend imperceptibly into a permanent threshold shift with continued exposure to noise. Oktay et al., found a higher degree of hearing loss associated with long-term exposure to EMFs generated by cellular phones. On comparing with the controls, those who talked for approximately 2 h/day were found to have higher detection thresholds. 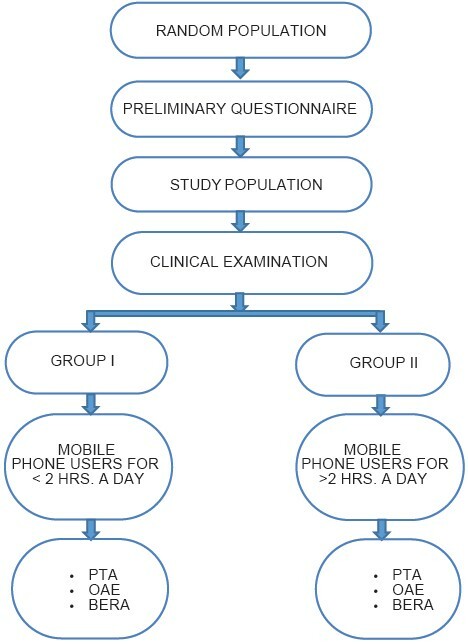 Using a structured questionnaire to collect a detailed medical history, Meo et al., concluded the use of mobile phone to be a health risk factor. Panda et al., concluded usage of mobiles for more than 3 years to emerge as a risk factor by finding a significant absent otoacoustic emissions (OAE) in users as compared with controls and the damage was bilateral. However, Uloziene et al., concluded that 10 min exposures to electromagnetic field (EMFs) emitted by Global System for Mobile Communications (GSMs) mobile phones, do not cause any detectable alterations in pure tone audiometry (PTA) and transiently evoked otoacoustic emissions (TEOAE) and also no subjective complaints after the exposure. Kerekhanjanarong et al.,  has reported worse hearing threshold in the dominant ear in the subjects who used mobile phones for more than 60 min/day than that nondominant ear. Sahoo et al., showed prevalence of sensorineural hearing loss in the habitual mobile phone users and concluded it to be directly correlated to the duration of usage. Also, Ramya et al., had found a significant increase in the hearing threshold in mobile phone users, which was associated with longer duration of usage. The aim of the study was to assess the status of hearing in a chronic mobile phone user and the impact of long-term exposure to mobile phones. The major objectives of the study included assessing the hearing status in chronic mobile phone users and identifying a possible link between regular cell phone use and the risk of developing chronic tinnitus. The study is a prospective study. 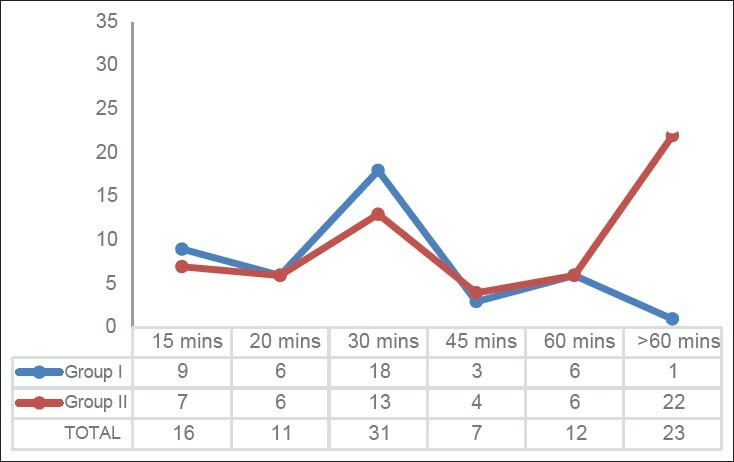 Group 2: Mobile phone users for more than 2 h a day [Figure 1]. The inclusion criteria for the study were students in the age-group between 18 and 30 years of age, without any other possible cause of hearing loss. The exclusion criteria for the study was persons with any other possible cause of hard of hearing such as tympanic membrane perforation, secretory otitis media, otosclerosis, otitis media, sudden/repeated exposure to noise without adequate protection, trauma to the head or neck, and ototoxicity. The patients were informed about the purpose and the procedure of the study and their consent was obtained for their participation in the study. The Institutional Human Ethics Committee (IHEC) approval had been obtained prior to commencing the study. Compilation of the data and statistical analysis was done with the help of Microsoft Excel and Statistical Package for the Social Sciences (SPSS) software version 16.0. Statistical assessment of hearing status of long-term (chronic) mobile phone users has been done by percentage analysis. Comparison of hearing and the dominant side and modes of usage were being done by Chi-square test. Brainstem evoked response audiometry (BERA) is an auditory evoked potential extracted from ongoing electrical activity in the brain, which occurs in the first 10 ms, after the onset of an auditory stimulus and recorded via electrodes placed on the scalp. The study population comprised of 100 individuals belonging to a mean age group of 21 ± 2 years, who were randomly sorted into Groups 1 and 2, with 42 and 58 subjects, respectively. Out of all, about 80% of them were right dominant users and 8% were left dominant users. Majority of them (73%) were in a habit of using mobile phones continuously for about 30 min at a stretch every day [Figure 2] and [Table 1]. Only a limited number of studies have been done so far, which point to one of the greatest technological innovations, the mobile phone, as a risk factor for development of hard of hearing. Most studies are concerned with electromagnetic radiation output from mobile phones, while forgetting the newer trend of using handsfree devices such as bluetooth or ear phones. But the point we try to make with this study is that sound, over a certain limit can result in NIHL. PTA served its purpose as a screening tool for major hearing loss. Using DPOAE, the presence of outer hair cell damage is detected earlier to PTA. Here in this study, DPOAE showed absent OAE in both ears for about 39% of the study population and rest with 16% for right ear alone and 18% for left ear alone. BERA showed abnormalities in waveforms in about 18% of study population, of which 5% had abnormal waveforms in BERA of both ears. Though, most of the individuals were right dominant, on comparing right side with left side we found that the percentage of loss in both the ears is higher. PTA showed 4K dip pattern in the audiograms of few subjects in both study groups, which suggests a possibility of noise induced loss since 4K dip is a feature of NIHL. 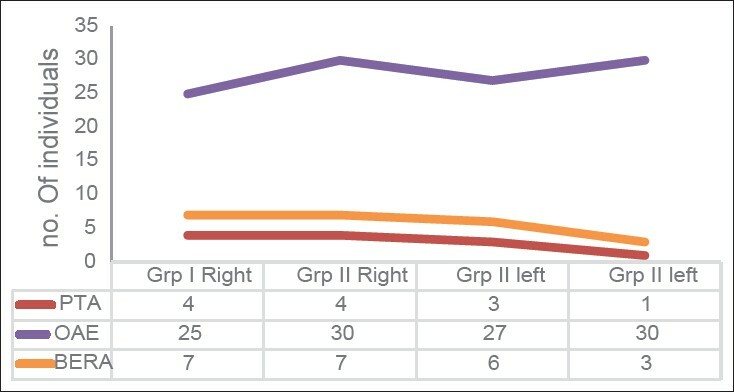 DPOAE showed a major difference in both groups, with 55% individuals having loss in the right ear and 57% in the left ear. BERA also showed abnormalities in waveforms in both sides (14 in right and nine in left), which may have occurred due to cochlear damage, either as a result of electromagnetic radiation or due to sound exposure, since, damage at base (cochlear) level may also affect the auditory brainstem response (ABR) wave latency [Figure 3]. On comparing subjects in Group 1 (<2 h a day) and Group 2 (>2 h a day), loss was found to be present in both, but it should be noted that there is a comparative increase in subjects having a loss in Group 2, which is shown in [Figure 4]. Hence, it appears to be quite obvious that the duration of exposure plays a major role in the pathogenesis of hard of hearing. Here, we can consider either exposure to electromagnetic radiation or to sound to be the abetting factor. An individual using a mobile phone for any purpose is in one way or the other exposed to either of these factors, that is, if he is using the mobile in hand while talking, then electromagnetic radiation has its effect and if he uses a handsfree device, sound produces its effect. As depicted in [Table 1], most of the study population (73%) was found to use mobile phones for at least 30 min or more for every call, for long-term and the percentage of hearing loss in those was found to increase with increase in duration of usage. About 5% of the subjects reported having tinnitus after mobile usage continuously, as per the response in the questionnaire and they have responded in it of using mobile phone for more than 30 min for almost every call. Similarly, Kerekhanjanarong et al., found worse hearing threshold in those who used mobile for more than 60 min/day and Panda et al., also found that increase in the duration of use as well as use of more than 60 min/day of mobile phones can lead to hearing loss at high frequencies. Oktay et al.,  also reported similar observations. Similarly in a very recent study by Sahoo et al., showed prevalence of sensorineural hearing loss in the habitual mobile phone users, which was found to be directly correlated to the duration of usage. Ramya et al., in her study, found a significant increase in the hearing threshold in mobile phone users when the duration of usage increases. While comparing the parameters of right and left side, no possible discrepancy is found to exist between them [Table 2]. The cause may be due to the widespread usage of headphones, while using the device either in awareness of the method of handsfree device or to listen to songs, which is most preferable. Yet, another possibility prevails, wherein people tend to use in the side of the hand that holds the phone while getting a call. Hearing loss is present in both the males and females. By this study, no significant relationship could be brought out between hearing loss and each gender. The study showed a clear relationship between the exposure duration per day or as a total and the amount of hearing loss that is to occur. With this, we come to know that loss can be found in people using mobile phone at least 30 min or more every call for a long-term. Intensity of hearing loss is directly proportional to the duration of usage and exposure to sound more than that regulated as a safe limit. Thus, presence of a mild or a very mild loss at the moment, in an individual of young age, has a higher risk of developing hard of hearing in the years to come. Especially, student population is becoming more addicted to this fancy gadget build multipurpose device. Though it depends upon for what and how we use this technology, we must understand the impacts of this very useful technology on us and use it in a safer way. In a very near future, mobile phone may emerge as a risk factor for hearing loss, which may be either noise-induced or electromagnetic radiation-induced. 1. "Census India 2011"[Internet] Censusindia.gov.in. Available from: http://en.wikipedia.org/wiki/List_of_countries_by_number_of_mobile_phones_in_use [Last accessed on 2009 Nov 10]. 2. Oftedal G, Wilén J, Sandström M, Mild KH. Symptoms experienced in connection with mobile phone use. Occup Med (Lond) 2000;50:237-45. 3. WHO. Mediacenter. Electromagnetic fi elds and public health base stations and wireless technologies. Fact sheet No 193; June 2006. 4. Sonia Gulati I. Hearing loss from headphones and earphones, September 2011. 5. Northwestern University (2005, December 16). IPod′s Popular Earbuds: Hip Or Harmful? ScienceDaily. Available from: http://www.sciencedaily.com/releases/2005/12/051216191834.htm [Last accessed on 2012 Jan 22]. 6. "Noise Dose Chart: Noise Exposure Limits". Available from: http://www.noisehelp.com/noise-dose.htmlhttp://www.osha.gov/dts/osta/otm/noise/standards_more.html [Last accessed on 2014 Feb 15]. 7. Oktay MF, Dasdag S. Effects of intensive and moderate cellular phone use on hearing function. Electromagn Biol Med 2006;25:13-21. 8. Meo SA, Al-Dreess AM. 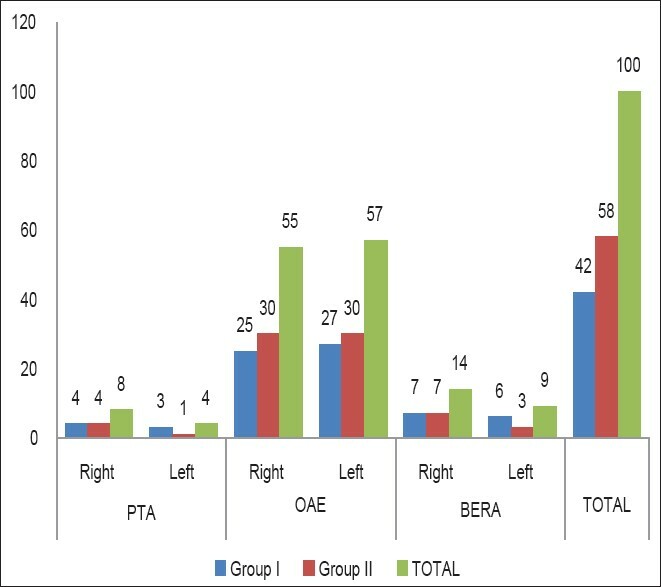 Mobile phone related hazards and subjective hearing and vision symptoms in the Saudi population. Int J Occup Med Environ Health 2005;18:53-7. 9. Panda NK, Modi R, Munjal S, Virk RS. Auditory changes in mobile users: Is evidence fothcoming? Otolaryngol Head Neck Surg 2011;144:581-5. 10. Uloziene I, Uloza V, Gradauskiene E, Saferis V. Assessment of potential effects of mobile phones on hearing. BMC Public Health 2005;5:39. 11. Kerekhanjanarong V, Supiyaphun P, Naratricoon J, Laungpitackchumpon P. The effect of mobile phone to audiologic system. J Med Assoc Thai 2005;88:S231-4. 12. Sahoo GC, Sebastian H. Prevalence of sensorineural deafness in habitual mobile phone users. Indian J Otol 2011;17:97-100. 13. Ramya GS, Karthiyanee K, Vinutha S. Effect of mobile phone usage on hearing threshold: A pilot study. Indian J Otol 2011;17:159-61. 14. Hutter HP, Moshammer H, Wallner P, Cartellieri M, Denk-Linnert DM, Katzinger M, et al. Tinnitus and mobile phone use. Occup Environ Med 2010;67:804-8.